What did the Democrats learn from the Tea Party? Barack Obama was elected president in 2008 and he took office in 2009. The Republicans were upset and out of anger and frustrations a group splintered from the traditional Republican party. That group became the Tea Party. They carried their flags wore their funny hats and constantly protested. The Democrats initially dismissed them and the president even said they were a part of “silly season”. The Republicans thought they could control them, but the Tea Party had their own agenda, and they were willing to do anything to make it happen. In 2010 they started supporting candidates that supported their mission and a lot of the traditional GOP stalwarts found themselves on the outside looking in. The Tea Party was against President Obama and anything he endorsed, touched or sanctioned they viewed as poison. As I watched them I could not believe they could sustain this level of zeal, but they did and they elected people to government who had a mission not just to shake up things, but to tear it up if necessary. Their persistence ultimately gave us President Trump. Now we are starting to see Trump dismiss disgruntled Democrats to his detriment. President Obama was elected twice, but he lost the House and the Senate and the Republicans and the Tea Party did all they could to hogtie his agenda. This is the kind of attitude that the Democrats must adopt if they expect to start the change in 2018. They have to stay agitated, aggravated, and motivated. They are being called sore losers, but in loss one can learn how to win. The Democrats have to have the resolve of the Tea Party and the Democrats will rise again. Hopefully, in 2018. By musesofamom | Posted in Uncategorized | Also tagged African American, African Americans, black america, black men, Black women, CNN, Current Events, Democratic Party, Democrats, donald trrump, Fox News, gop, media, President Trump | Comments Off on What did the Democrats learn from the Tea Party? President elect or L.L. 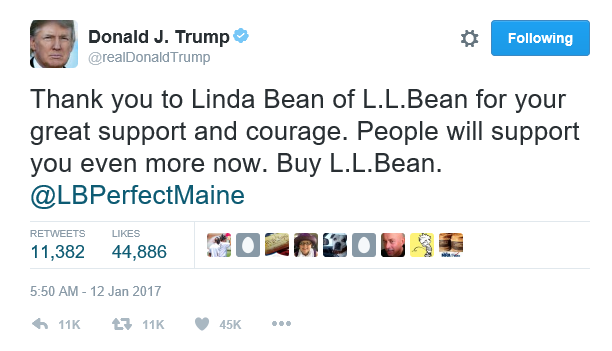 Bean spokesperson? President Obama has lived the last 8 years under a microscope. Everything he did was analyzed, over analyzed and re-analyzed. He was accused of being a celebrity. When he went on late night talk shows he was accused of being undignified, but that was before we got the Tweeter-in-chief. 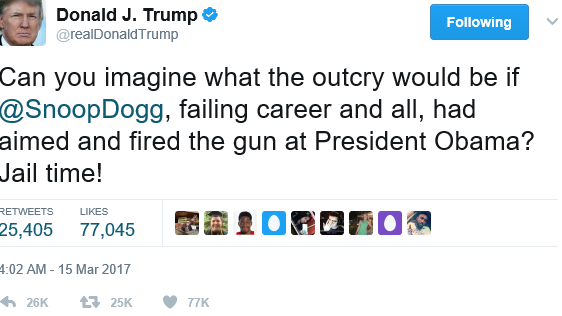 He tweets about everything and nothing and his acts are labeled as a new way of handling the office. He is a new kind of president. Dignity is no longer a part of the discussion. He has a cabinet of millionaires and billionaires that are now charged with handling the problems of the masses. The masses they pass on the streets while riding in their stretch limousines. It is a new day in DC. Not a better simply a new day. Tonight I sit waiting for President Obama’s Farewell Address and I am saddened to see him go. He was and is a class act. It is sad to say his successor is not. Nobody respects the black vote. The Democrats take us for granted and the Republicans ignore us. Well, The Donald polling 1-2% in the black community has articulated a new strategy, and that is the “what the hell do you have to lose: strategy. Not really offering anything new. Not even coming into the community to articulate it. Just standing in front of mostly white crowds he just screams his new words. Is this truly the way he should be talking to black folks? 2016 is a different kind of election. Hillary Clinton is no Barack Obama and black people are not going to come out in those Obama numbers for her. So my advice is they both need to learn not all blacks live in poverty. We are like all Americans…different, and they need to address us that way. Is this a time for Unity? My pastor has shared this story with the congregation: You can tie the tales of two cats together and they are unified but they are not in unity. * That is what the call for unity sounds like today. Unity requires an agreement. it is impossible to get an agreement when the two sides view the world from completely different perspectives. Right now we have two camps. One is in despair at what the police have down under the state cloak of protection. The other camp is grieving at the loss of 5 police officers, but there is another camp that shares the grief of both camps. this camp wants answers. they want to know the details of the police involved shootings and they also want to know how a man who served his country would pick up a gun and kill police officers marching with protesters last night. We also know the police were on hand to also protect the Dallas business community. They were doing their jobs and it was pure evil to be killed doing that. So today might not be the day we find common ground but maybe soon. *Not cats were used for the illustration. By musesofamom | Posted in Ebony Mom Politics | Also tagged 5 policeman killed, African American, African Americans, black america, black men, Black People, Black women, cbs, CNN, Current Events, Dallas shootings, Fox News, media, politics, race, racism | Comments Off on Is this a time for Unity? Are the Obamas getting a little too thirsty? The President recently appeared on reality television and Mrs. Obama is a frequent guest on shows like Ellen? Are they spreading themselves a little thin? Are they starting to appear thirsty? Share your thoughts. Every time Donald Trump says something wrong or does not correct something said that is wrong he takes a hit from the media. His poll numbers go up but the media sits in judgment predicting his downfall, but it hasn’t happened yet and one has to wonder will it every happen? He has insulted the Mexicans, John McCain, Megyn Kelley, Carly Fiorina, Jeb Bush’s wife and President Barack Obama and he has never apologized. He is a man in own opinion who is never wrong and his followers love him. As they say if it “ain’t broke don’t fix it” and this is working for him so accept the fact that apology is not in his dictionary neither is humility.